The Winchester solid mellow brass 2 lamp 36cm picture light from the Rochamp solid brass collection is traditional, practical and attractive. Detailed wall mount and twin adjustable arm supporting a hinged 51cm lamp head containing two lamps. The arm is hinged at both ends, with full adjustment and detailed thumb lever to lock in place. 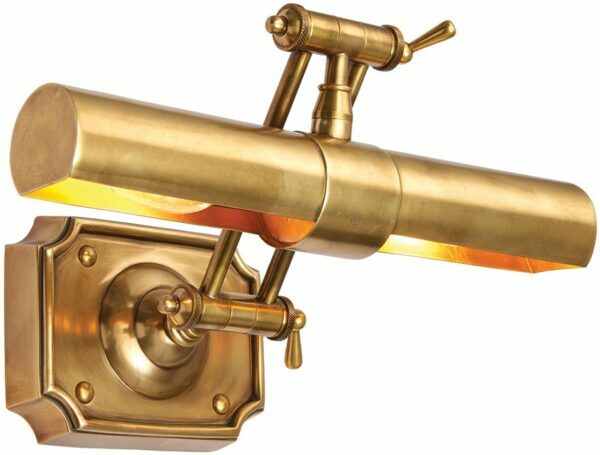 This elaborate 14 inch picture light is made from solid brass. Both height and reach are adjustable so you can direct the light exactly where you want it. It is dimmable and LED lamps can be used if desired. Made entirely by hand, using traditional sand casting techniques passed down through generations, this picture light is an example of workmanship at its best and would look perfect in any themed, traditional or more modern environment. This picture light has been lacquered to ensure that it continues to look wonderful without polishing. It is important not to polish this fitting with any abrasive or chemical cleaner as this will damage the lacquer and spoil the finish. A light dusting or cleaning with a slightly damp cloth is all that is needed to maintain its good looks. The Winchester solid mellow brass 2 lamp 36cm picture light, part of the highest quality Rochamp collection, designed and manufactured by Interiors 1900.